UNITED NATIONS, November 26 -- A day after UN Spokesperson Michele Montas told Inner City Press she would seek a comment from Cyprus envoy Alexander Downer about the naval and oil exploration dispute between Turkey and Cyprus, the indirect answer was that Downer and the UN have no comment. They argue, against all logic, that this dispute has no impact on the talks about the Turkish Republic of Northern Cyprus. Is this just sloppy and wishful thinking, or something more? Following Cyprus' complaint to Ban Ki-moon about the naval run-in, Turkey has said it will file its own complaints. Cyprus then moved to file complaints about air space incursions. As Inner City Press previously inquired into and reported on, Downer has another, for-profit job, with the business consultancy, Bespoke Approach. His web page there mentions, in context as a reason to hire him, his envoy position with the UN. Is this proper? What safeguards are in place? These questions were never answered when Downer was appointed, or since. Wednesday, Inner City Press asked a senior UN official, who acknowledged that sometimes conflicts are not considered until after an envoy is appointed, if then. 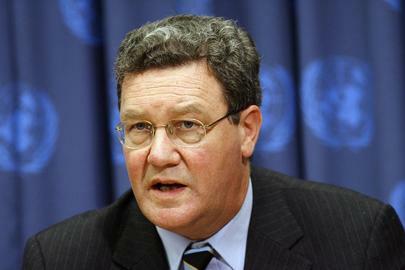 Nor, apparently, is Downer's employment contract with the UN a public document. Downer's fellow Australian Joel Fitzgibbon, far from withholding comment, has aggressively criticized the UN and its Afghanistan envoy Kai Eide, click here for that. So Downer's silence is neither national character or strategy. Is it just bad diplomacy, or laziness? Downer's silence in the face of this escalation can be contrasted with the near-immediate comment issued by another envoy in the region, Matthew Nimetz. When the Former Yugoslav Republic of Macedonia sued Greece in the International Court of Justice for blocking its application to join NATO, Nimetz issued a statement that FYROM had assured him this would not impact talks on the name issue. Following Inner City Press' exclusive report on November 25 that UNIFEM's handout about the UN Trust Fund to End Violence against Women refers not to FYROM but to "Macedonia," the spokesman for the UN Development Program had told Inner City Press that "Re FYROM, this fund and project is managed by UNIFEM. They are aware of the error in the pamphlet and are addressing it." Inner City Press called and spoke with UNIFEM's media consultant Beatrice Frey, who said she would obtain and provide information from officials of the Trust Fund, with whom she was then in a meeting. Inner City Press also asked what UNIFEM does on the issue of violence against women and sexual exploitation and abuse by UN Peacekeepers. Six hours later, no information had been provided on either topic.